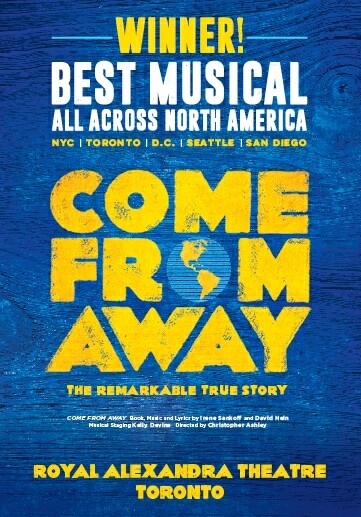 After a sold-out, standing-room only Toronto engagement before heading to Broadway, the breathtaking new musical Come From Away returns due to overwhelming demand. Newfoundland been called the “edge of the world.” The weather is wild, but the locals never lack for warmth. This is where a remote town became the epicenter of a remarkable true story filled with unusual characters, unexpected camaraderie and uncommon generosity. Recommended for ages 7 and up. Showtimes at 8 pm Tuesday–Saturday, 1:30 pm Wednesday, and 2 pm Saturday and Sunday. February 2018–January 2019 at the Royal Alexandra Theatre and February 2019–April 2019 at the Elgin Theatre.